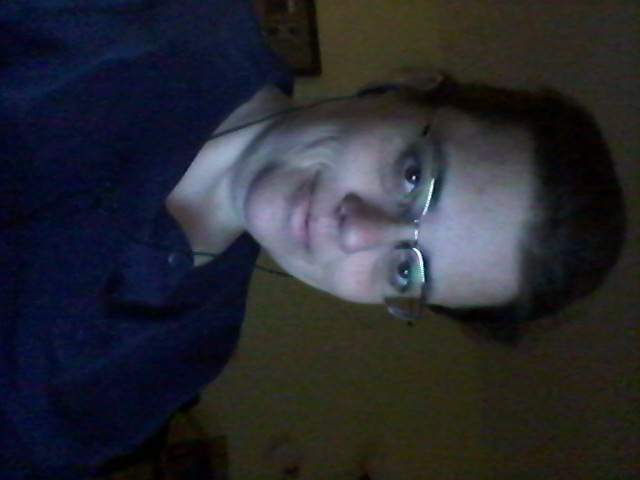 Turning on the LED power in my work station…my tired eyes need soft white light! The new energy smart LED lights from GE protect the environment by not having mercury and other chemicals in them (making them safe to put in the trash and not require special disposal). They also use MUCH less energy than incandescent bulbs (the ones we all grew up with) and even CFLs. So where better to take a picture of my new bulbs than out in nature? When I heard about the opportunity to try the new super bright LEDs from GE through a shoppertunity with #CollectiveBias, I jumped at the chance. I think it’s important to protect creation through conserving resources and let’s face it, in this day and age it’s important to save money wherever we can. 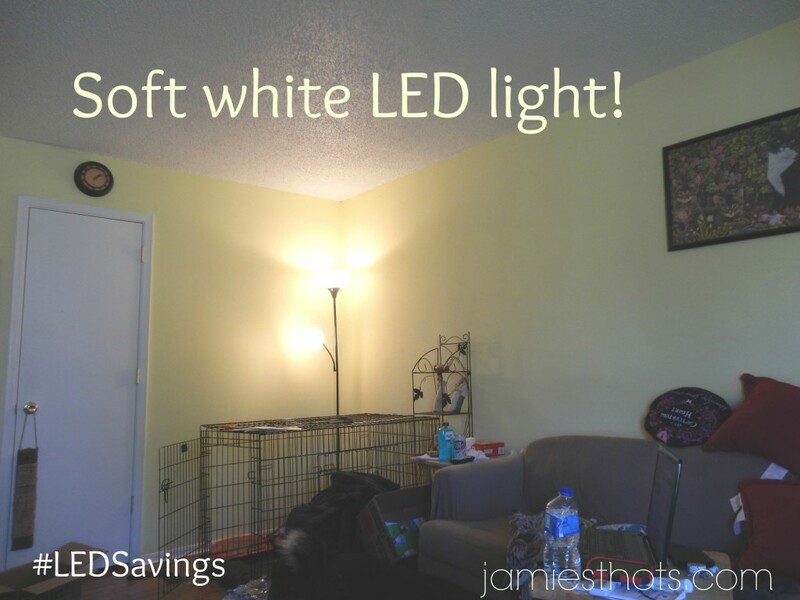 I decided to focus on how #LEDSavings could help improve my work environment but as I started learning more about the LED lighting, I realized it was a good investment for the rest of the house. But don’t just listen to me, check out these photos and the results I got from using the energy consumption calculator that shows how LED power made my work station brighter and more cost efficient. When you’re self-employed and work from home, there’s really no one else you can blame when the working conditions aren’t just exactly how you would prefer them, right? Here’s the thing. I have a home office but I also enjoy bringing my laptop into the living room because it’s more centrally located. The problem with that is the living room is poorly lit. We don’t have any ceiling light fixture and so we have to rely on floor lamps to light the room (table lamps would just get knocked over by the four fur kids). These floor lamps use CFLs, which we use to save electricity use and costs. But the light quality is just not that great, especially when you consider the CFL light bulbs have to warm up. CFLs save energy costs but they take a while to warm up. When I come into a room, I prefer to be able to see and use the light immediately. 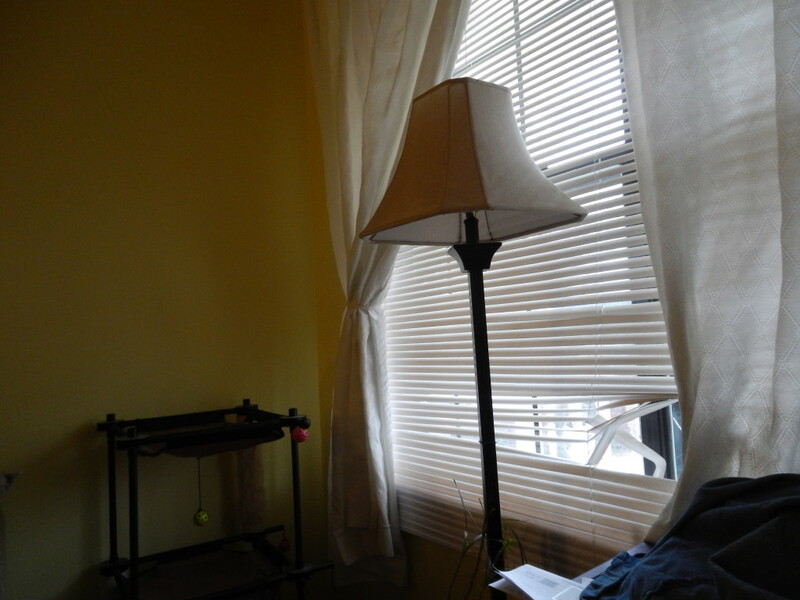 You can see from this time lapse demonstration that it took a while from no light to turning on the lamp to full power. Also note the lighting is really yellow and kind of harsh. Not a great environment when you’re working on a computer 10 hours a day. 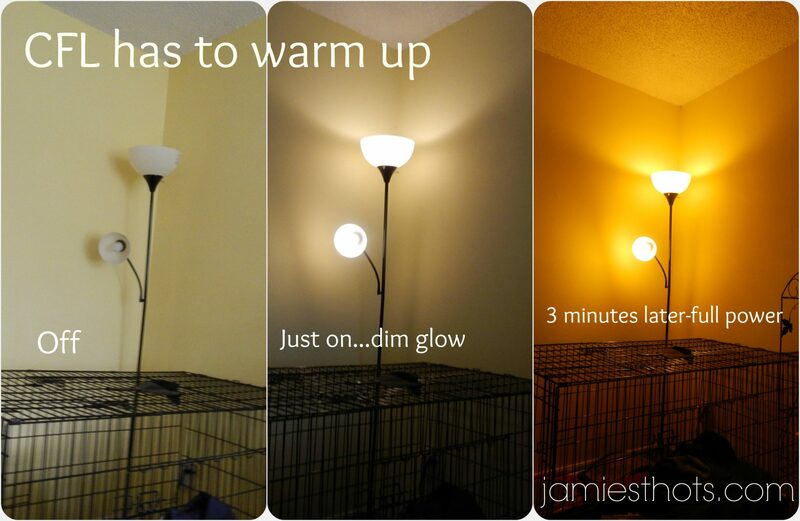 Now look at the progression for how long it took the LED light from GE to warm up. You’re not missing anything. This is one picture. The camera doesn’t do it justice but the light turned on full power immediately and cast a bright but gentle glow throughout the entire room. Again, please excuse the mess. I’m talking about my real life here not something that was stylized in a studio. The difference is real. The obvious solution for wanting more light is to get another lamp, right? We have one. But it needs to be rewired. That’s why I jumped on this chance for the LED lighting. It’s not glamorous but our front room can be messy (notice the dog kennel!) and we don’t have time right now to mess with rewiring the lamp. I needed a solution quick and easy. I’m also thrilled with the softer but more intense lighting that the LEDs offer. Please excuse the torn blinds. It’s a hazard of having two cats. I love this lamp but it needs to be rewired and to replace it with one just like it would cost $50. When we do get it rewired I will be placing an LED light bulb in it. Our living room will go from the worst lit room in the house to the brightest! 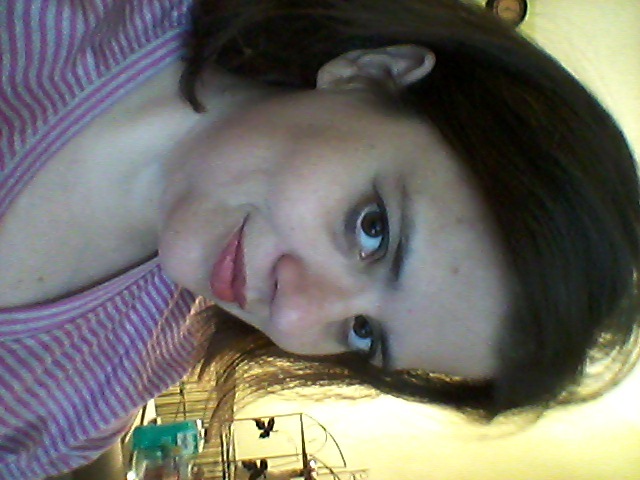 Just to demonstrate the difference, I took “selfies” of myself without any light on yet it was in the middle of the day and I was in front of the big window you see in the above picture. 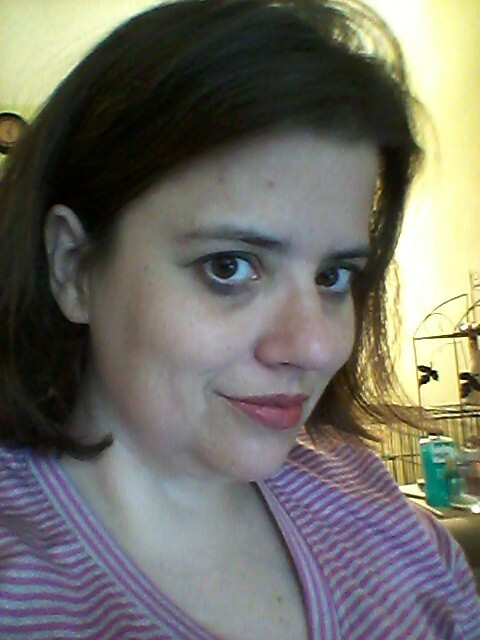 The next selfie is a shot of me looking much happier and less strained on a day when I was able to work with the new lighting in the background. This was taken on a sunny day near a window. Still kinda dark, eh? 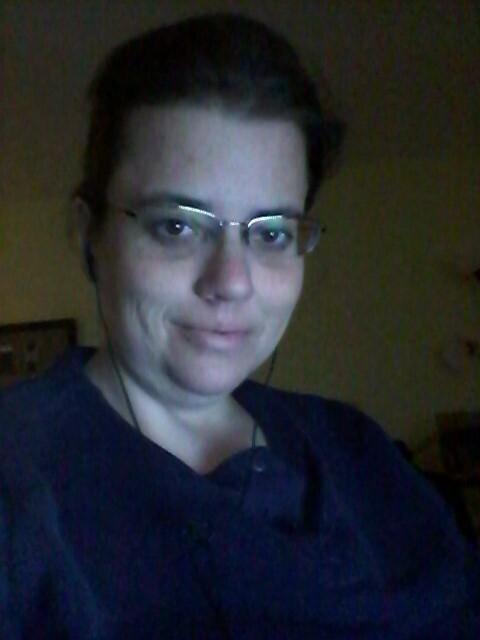 When I know I’m going to be working for long hours at the computer I often wear my glasses to lessen potential strain on my eyes. Much better lighting with the LED lights from GE. No mercury, lead or glass which makes them easier and safer to handle and dispose of in a few years when they go out. They are more visually attractive than CFLs. I’ve always thought the weird spirally lightbulbs were ugly. The new LEDs are “normal” looking. They are dimmable if you have that kind of lamp and they have an almost instantaneous turn-on time. They save up to 90 percent compared to the “old” (incandescent) lightbulbs. There’s something you should be prepared for if you head out to Sam’s Club to buy these in bulk like I did. The bulbs are such advanced, energy saving technology that they cost about $10 each (but until May 1 you can print this coupon). But don’t let that deter you. 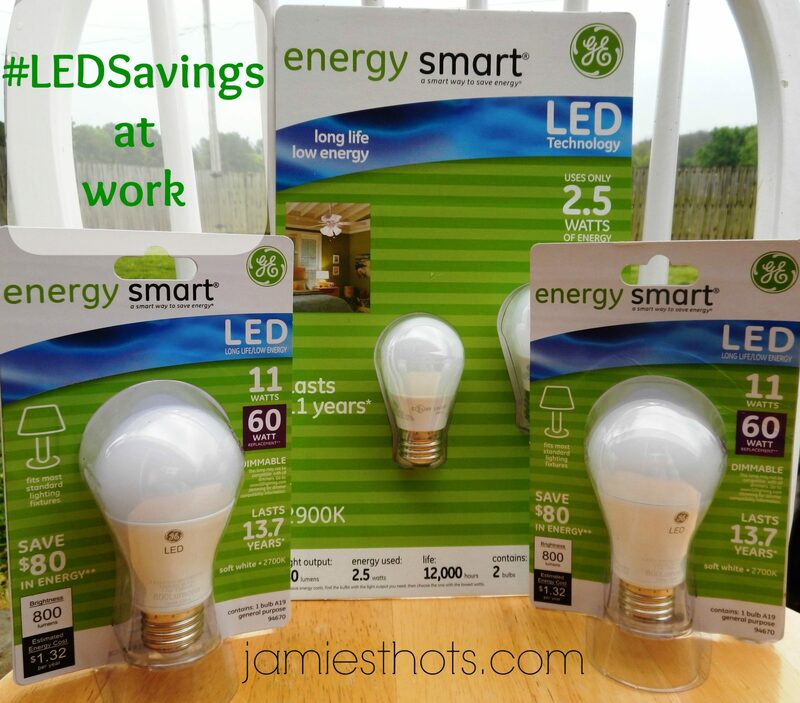 After I used the GE Energy Savings calculator, I realized that there really is a long-term savings (and did I mention better light? ..OK, I’ll stop). Check out my personal example. I counted and I have about 17 “slots” where a lightbulb could go. 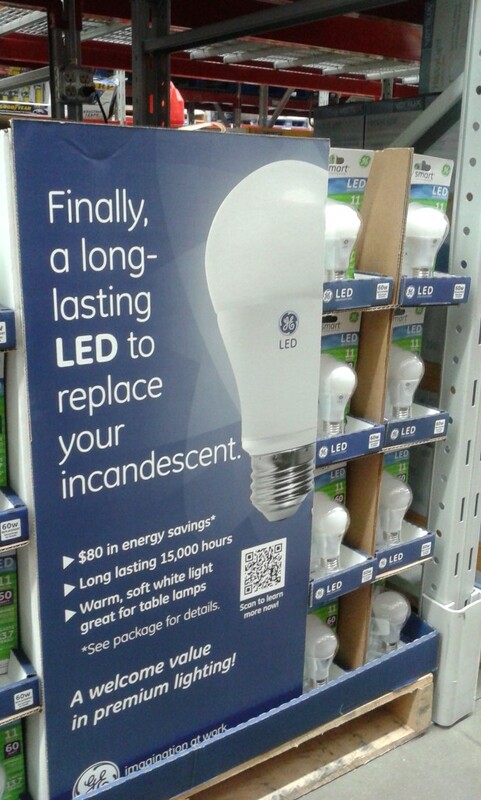 If I were switching out all the lightbulbs at once, that would cost me about $170 at Sam’s Club. But get this, according to the energy savings calculator I’m saving nearly $197 every year by using the LED lights. The GE Energy Smart LED lights are easy to find in Sam’s Club. Just go to the home decor department and look for the lamps. The lightbulbs are in the middle of the aisle. They have lots of options for LED lights and information on what they can do for you. 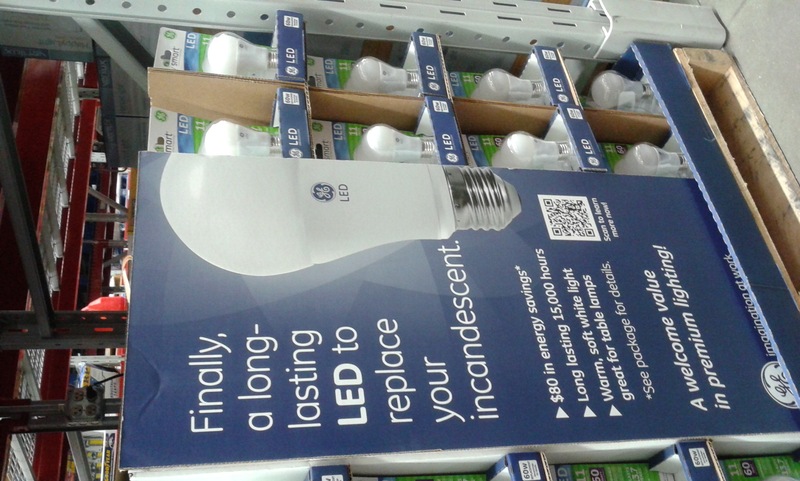 It really is easy to buy lots of lightbulbs at Sam’s Club. If you’re anything like me, my lightbulbs all seem to go out within a few days of each other when they are in the same light fixture (especially the bathroom). How do you feel about the lighting in your home or office (or home office?) Is it adequate? Are you paying an arm and a leg each month in utility bills? Now is the perfect time to consider switching to LED lighting. Cool, I wasn’t sure about using LED bulbs, but think I’ll give them a try now. I love them. can’t wait to get them in my bathroom!